A special moment for Kook Jin Nim and Soon Ju Nim. After we received word on December 27, 1988, that there would be a Blessing in Korea, a flurry of preparations were made, and of course the lines of communication between New York and Korea became very busy. Still, as our staff from the International Blessed Family Department in New York boarded our plane for Korea, I wondered if things had been communicated and if someone would meet all the planes to let everyone know where to go. Therefore, when we arrived in Korea with some 25 or more boxes of veils and other wedding items in hand, we were especially happy to see Rev. Kwak and Rev. James Baughman there to greet and help us. It was a great relief to see that buses had been organized to meet each flight. We all stayed at our very large and impressive McCol factory in Yongin, Korea. The Korean family kindly provided each person with warm blankets. Shortly after we arrived we met with leaders of the Korean Unification Church centering on Rev. Young Whi Kim and an organizational structure was made regarding the wedding. We were grateful Mrs. Durst was able to attend and help both the Korean and western sides understand each other. 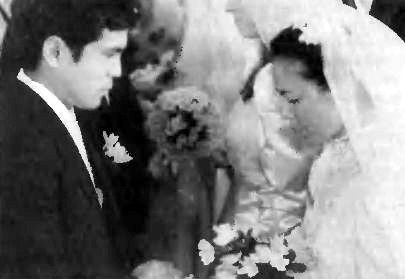 The Korean members were busy preparing for all three weddings: Kook Jin Nim and Soon Ju Nim's, the 72 Couples', and the 1,275 Couples'. By January 8 many of the regional leaders from other countries had arrived and we all heard the simultaneous translation of Father's speech at Sunday service. Father spoke with great confidence about his return to Korea. He said, "If the government makes a committee to unite North and South Korea, who do you think they ought to ask to be chairman?" Through reeling Father's confidence and seeing the regional leaders representing all the nations, I could sense that the foundation Father has throughout the world has indeed come with him to Korea. He told us that in three or four years we will see amazing strides of advancement toward the unification of North and South Korea. I felt that Father must be relieved to finally be at this stage, bringing all the fruits of his labors back to Korea. As in America, Father also urged all the Korean family to go to their hometowns. Everyone should try to restore their families. 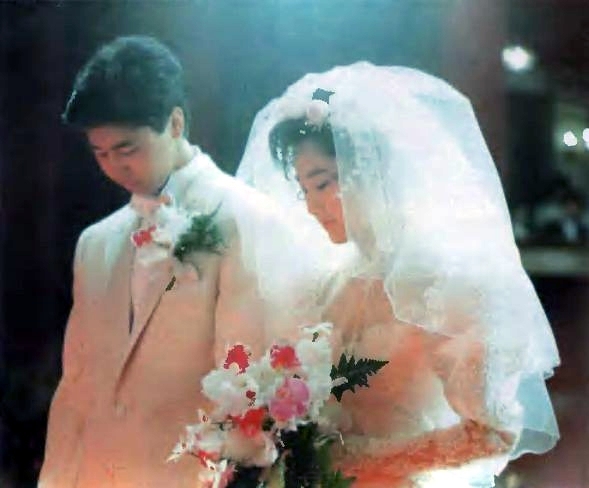 Kook Jin Nim and Soon Ju Nim's Wedding, January 10, 1989. He spoke about Kook Jin Nim and how his spouse, Soon Ju Yu [daughter of Jeong Ok Yu], was chosen. He said there had been revelations that she was heaven's choice. Her parents are from the 430 Couple Blessing, which was the first Blessing extended to include others besides Koreans. Shortly after the 430 Blessing was the 43 Couple Blessing of couples in Japan, Europe and America. Therefore it represents a worldwide blessing centered on the nation of Korea. Kook Jin Nim's name also means country and thus he represents Korea. On January 10, Kook Jin Nim and Soon Ju Nim were blessed. Father has set the tradition of genuinely loving others before his own family, and this means the True Children had quite a sacrificial course to grow through. 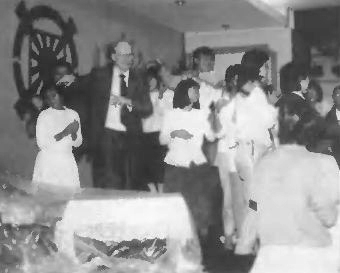 I felt True Parents were very proud that Kook Jin Nim had successfully gone through this course and had even helped guide many of the oldest western blessed children [from the 43 Couple Blessing in America] to unite with True Parents. In the past few years Kook Jin Nim has been talking with many of the older blessed children and teaching them. Many were in attendance at the wedding and their respect and affection for Kook Jin Nim were evident. It was especially wonderful to see all the newly matched 72 Couples as well. They were the bridegrooms and bridesmaids for Kook Jin Nim's wedding. At the end of the ceremony Father prayed deeply, and at one point he mentioned Mr. Kamiyama's daughter's name. Later, it was explained that she was representing not only the second generation from Japan but also representing America as well. Through her blessing to the son of one of Father's cousins, the Adam, Eve, and Lucifer nations could come together. Many of the children here in America know and respect her and were inspired to see her obedience and faith as she goes through the course that lays ahead of them as well. Just prior to the Blessing, she and all the western blessed children over 13 had completed a workshop that Hyo Jin Nim asked the elder Korean blessed children to give in America. Right after the "hyungs" and "onnis" (elder brothers and sisters) had finished this workshop, they were quickly called to Korea for the matching and Blessing. 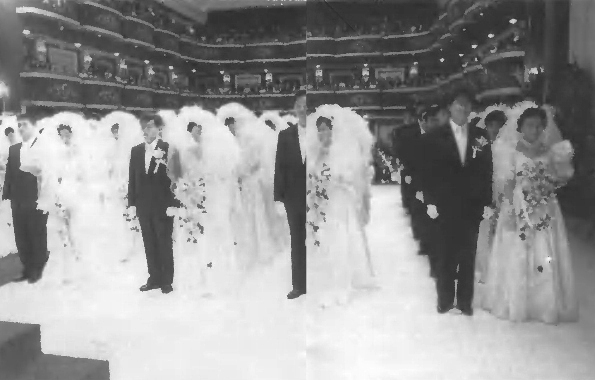 Wedding of the 72 Couples of the Second Generation, January 11, 1989. The night before Kook Jin Nim and Soon Ju Nim's Blessing Father began to match couples for the 1,275 Couple Blessing. His infinite love for each of our worldwide family members was very visible in the patience, time, love and care he extended. Even though his own son was going to be blessed the next day, he stayed up practically all night and there was no sense of rush. He spent lots of time speaking to the group, talking to individuals, making sure they felt at ease. One could sense his loving determination to match as if each were his own child. He was very concerned about creating each couple. First he asked all the Japanese to stand. They set the standard and atmosphere of absolute unity with Father. It was incredible to see Father matching members from 80 nations. I could really feel the progress since 1979 when Father first began to match internationally on a large scale. The atmosphere was vertical and a foundation from previous international marriages was already set so that acceptance flowed much more readily. Many members' situations were resolved in very heavenly ways. Father matched almost the whole night before Kook Jin Nim's wedding and then returned again to the matching room after the evening entertainment. Teams of elder blessed members from Korea, Japan, America and Europe administered the Holy Wine on the morning of January 12. It was inspiring both to see these teams working together and to see the faith of the more than 200 members who came with pictures. 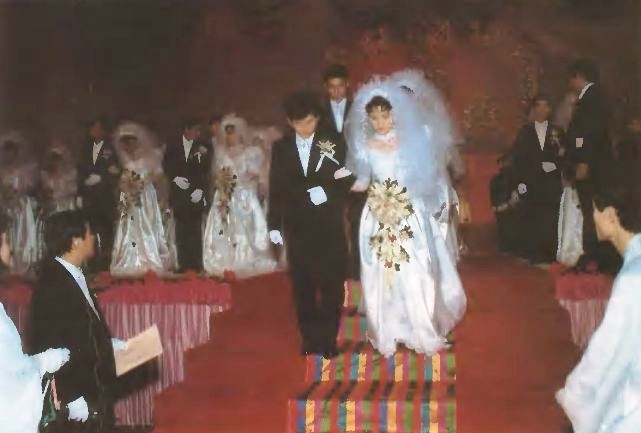 On January 12, 1989, at 2 p.m. all the couples gathered in the beautifully decorated auditorium in the McCol factory for the Blessing. The auditorium's total transformation with artwork and colorful painted signs was yet another expression of True Parents' special love and care. Dr. Bo Hi Pak, as the master of ceremonies, and Dr. Mose Durst both gave moving congratulatory addresses. I had a very deep experience watching the couples coming off the stage after receiving the Holy Water from True Parents. I felt like Heaven and all their ancestors were cheering with tears of joy for these couples -- the fruit of Father's 43-year indemnity course from all over the world. It was amazing to see the beauty and harmony of each new couple, most of which were international, and to experience their being gathered in Korea and blessed by God and True Parents in such a splendid way. Heavenly Socializing The evening entertainment after the 1,275 Blessing came from the couples themselves and was also very heartwarming. Imagine 3,000 people seated on the floor in a large room with True Parents on chairs in the middle. We could see True Parents' faces and they seemed to appreciate the introduction to each performance given in Korean by Mr. Bernhard Quandt, who made us all envious by his total mastery of the language. It was delightful to see the many Korean members really enjoying the humor and spontaneity of the western members. True Parents were especially amused by one brother who spoke Korean with an African accent! Many international groups shared their cultures with True Parents, who happily laughed and clapped enthusiastically for each performance. We all wanted this tremendous outpouring of heart to go on and on. When Father wasn't there, Rev. Paul Werner organized internal guidance to be given by a number of different elder members. During breaks in the lectures and activities many couples congregated for "heavenly socializing" in a place in the McCol factory where we could purchase drinks. Also, we could take walks right out into the countryside. Everybody exclaims happily upon seeing so many western faces, which many quickly identify with Father. One restaurant owner said, "I support Rev. Moon, too." There was support everywhere. It was a profoundly stirring experience to be with these brothers and sisters who came with such a willing heart to offer themselves and bring victory in their matching and Blessing. I felt overwhelming pride for them, as I watched them, standing in line to shower and brush their teeth, and then being totally transformed in their wedding clothes, so handsome and beautiful. They had prepared themselves spiritually, emotionally and materially -- many came with their mobilization donation, and because of this heart, I felt God could really bless them. In fact, I could see so many situations being worked out. I truly felt like bowing, not only to our incredible True Parents, but also to these precious brothers and sisters. It was a total victory. On Thursday morning at 11 a.m. the Holy Wine Ceremony was held. Honestly speaking, I had a bit of a headache from the schedule of the past three days and I thought I would have to just push through the day. However, much to my surprise I had a very deep experience in the Holy Wine Ceremony and the Blessing. In the Holy Wine Ceremony, after going through the procedure carefully so as to avoid any mistake, I sat down and began to pray. Suddenly, I felt both spiritually and physically the sensation of a wave of water washing through me and cleansing my blood of all the impurities and dirtiness. In the end I felt as if I were clean and fresh and new, and I felt a tremendous calmness as well as a deep sense of gratitude to be rid of Satan's blood, and to be in Heavenly Father's territory. What a great feeling that was! Quickly afterward came the Blessing Ceremony and the procession. Ritsuko and I had been in the position of the first couple, which would lead the entire procession. However, at the last minute a representative Korean couple was placed in the lead position. This change turned out to be a blessing in disguise, as I was now able to focus more fully on the ceremony without having to worry about being the lead person. When Ritsuko and I came up to the platform and approached True Parents, I was standing on the far right side and would pass directly under Father. As I neared Father, I looked up at him and at that precise moment he looked down right into my eyes, and the first handful of Holy Water that he threw landed squarely on Ritsuko and myself. I'll never forget that moment of looking right into Father's eyes. I felt so deeply that I was now a part of True Parents' family and I had finally somehow come back home, in spite of all the difficulties and struggles of the past many years. And not only that, I was being blessed with this truly wonderful sister. I felt overwhelmed, and began to weep. I ended up crying and crying. I must have cried for over half an hour. Since I can't remember the last time I cried, you can imagine what a wonderful experience it really was. That turned out to be quite a day. Processional march of the 72 Couples of the Second Generation. Question: What was Kook Jin Nim's wedding like? Answer: It was beautiful. All the regional directors from around the world were there. In the morning we went from Yongin, where the McCol factory is, to the Little Angel's school; the main auditorium, which is beautiful even by itself, was decorated magnificently. 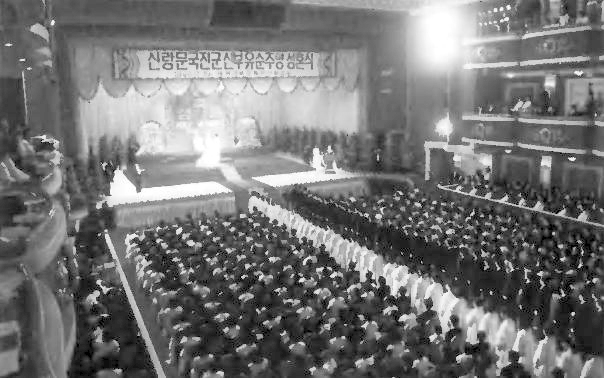 It was set up like it was in the World Mission Center Grand Ballroom at Hyun Jin Nim's Blessing, with a brother/sister, brother/ sister seating, blue suit and white chima-chogori, blue and white arrangement. The ceremony was simple and not so long, and the True Children were there. Kook Jin Nim looked very happy and Soon Ju Nim was very beautiful. Question: When did Father do the matching for the 72 Couples Blessing? Answer: I think Father matched on a few occasions, at Hannam-dong, by a mixture if pictures and people. Then everyone came in person for the actual Blessing, including Mr. Kamiyama's daughter. Question: Was she the only non-Korean? Answer: Yes, and Father requested her for a very important providential reason. She doesn't just represent Japan -- she also represents the West. The next day, the 12th, was the Blessing of 1,275 Couples. Question: How did Father fit in everything? Answer: This was the most incredible story for me. I was down at Yongin with all the members and Father came on the 9th about 11 p.m., started matching, and went until 4 a.m. on the 10th. Then he returned to Seoul and blessed Kook Jin Nim in the morning, came back to Yongin in the afternoon to match for a couple more hours, and went back to Seoul for the evening celebration. After that he returned to Yongin around midnight and matched again almost all night. Then he went back and blessed the 72 Couples, came back for a couple of hours to do some more matching and then went back to Seoul for the evening ' celebration of the 72 Couples, and finally returned to match from about midnight until 4 a.m. again. That same morning of the 12th, he gave the Holy Wine ceremony and at 2 p.m. was the Blessing. At the evening entertainment, Father and Mother sang four songs for everybody, and later met downstairs with some Japanese leaders until about two o'clock in the morning. Question: Did he look tired? Answer: He didn't look tired at all. He looked great the whole time, but the only time he could have slept was in the car; the trip from Seoul to Yongin took about one and a half hours. He said he had to complete the Blessing by the 12th, providentially, because he needed to connect it to the 6,500 couples. If you add 6,500 and 1,275 it come to about 7,777. It was very important to connect this Blessing to his 43-year course. Question: What did Father say to the Blessing candidates? Answer: One night he spoke about the importance of McCol for a short time, and another night he spoke almost two hours very seriously about the importance of the Blessing, of remaining pure, about how serious he is about the Blessing. In that talk and in one other he stressed especially the responsibility of the woman in the fulfillment of the Blessing. The significance of this particular Blessing is connected to the unification of North and South Korea. Question: Do you know about the Japanese members who were blessed back in October? Answer: Most of them went back to Japan immediately after the Blessing to prepare to stay in Korea longer, but some were starting to return to Korea while we were there. So our Korean members were dealing with a lot at once. The fifteen hundred buildings were not yet finished and the Korean church centers are not that big. Singing and dancing at the 1,275 Couples evening entertainment. Question: What was most meaningful for you? Answer: The high point was being in the matching room with Father. I could really see God working through Father, by seeing that the kinds of couples being put together were so beautiful and seemed so right. Father is very quick but he takes so much care. He seemed very happy about the Blessing itself. Question: Did you get an idea about Father's plans for the future in Korea and in China? Answer: I think that Father's attention is on both places and that they are connected to each other. Actually, Father is worried that the unification of North and South Korea will happen too quickly, that people in the South may swallow the propaganda from the North too easily. So Father is focusing on education, and Rev. Kwak is lecturing every day somewhere, to somebody, about the Principle and unification. China fits in because there are a billion people there, and Father thinks they are ready to respond. Now that Father is on the global level, he is sending ambassadors to the world. All of the six new IW's (chosen at the December 20,1988, leaders' meeting) have some special foundation with True Parents. He told them that they are ambassadors of True Parents, not IW's as we have traditionally received them. Their responsibilities are more far reaching. They are not going only to meet the members, but also to introduce True Parents to the leaders of the world. Father asked them to take the World and I, Washington Times, and Insight magazine and show them what the Unification movement is doing on every level. If the leaders of the countries can be moved by the IW's and the brothers and sisters in those nations, then a whole new providential power can be developed. 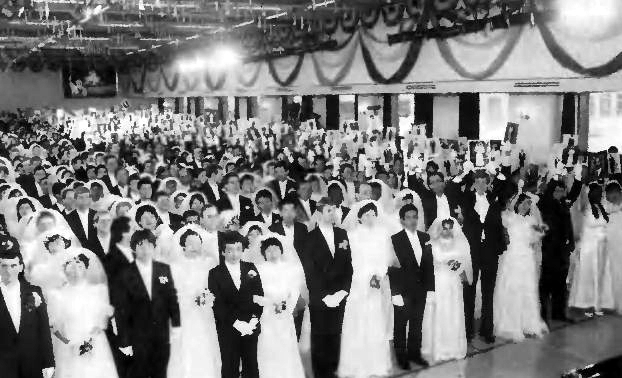 1,275 Couples Wedding, January 12, 1989. 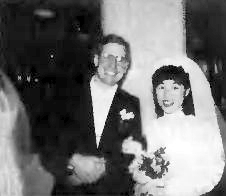 In many ways the January 12 wedding underscored more clearly than previous blessings the seriousness of international and intercultural marriage. Among the 2,550 brides and grooms were many members from third world countries whose participation in the ceremony involved breaking their national customs -- and even laws -- in a big way. Several black South Africans who were matched to whites will have to leave their homeland and emigrate to their new spouse's home because of their country's apartheid restrictions. Other members may never be able to return home. A church missionary said that a number of Moslems would have to seek asylum in other countries for fear of the strict religious laws banning marriage outside the Islamic faith. He said women from some Middle East countries could face the death penalty if they returned home. A few parents were able to make the journey to Korea. Among those from Europe were Jim and Joan Perkins from Maidstone, England, whose son Andrew, 27, was blessed with a Belgian sister. Mrs. Perkins said she was "happy, excited and pleased. I think it's great. I'm sure more parents would have come if it hadn't been so far." Some 600 participants remained in Korea after the Blessing. The members dispersed throughout Korea, staying at local churches, studying some Korean, and witnessing.